To Use: Mix 270ml (9 floz) of hot water with 45 grams (1.6 oz) of Miso Ramen Soup Base. 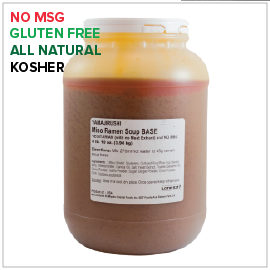 Ingredients: Miso (Water, Soybeans, Cultured Rice (Rice, Koji Starter), Salt), Filtered Water, Canola Oil, Salt, Yeast Extract, Toasted Sesame Oil, Carrot Powder, Garlic Powder, Sugar, Ginger Powder, Onion Powder, Chili. To Use: Mix 270ml (9 floz) of hot water with 30ml (1.1 floz) of Shoyu Ramen Soup Base. 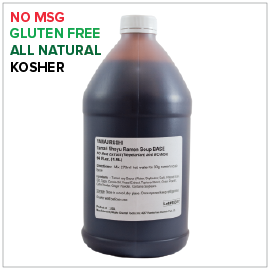 Ingredients: Tamari Soy Sauce (Water, Soybeans, Salt), Filtered Water, Salt, Sugar, Canola Oil, Yeast Extract, Tapioca Starch, Onion Powder, Garlic Powder, Ginger Powder.